On the March for Science Facebook page, someone asked how group members might engage in productive conversation with a family member who holds opposite ideologies. The query immediately prompted hundreds of comments and suggestions, with the tally increasing by the minute. The surge of responses underscores growing concern with scientific/political stalemate. The notion of a magic bullet to reach people is deeply tantalizing, but alas there is no simple answer: Connecting with someone takes thoughtful effort and humility. But what follows is one example of a dialogue that played out in a surprising and encouraging way. People can change their outlooks, if they strive to build trust and listen to each other. Consider the path taken by Brenda Alfred and Heidi Steltzer in their conversation about common ground on climate change. Alfred retired in 2014, but downtime didn’t suit her. “I had gotten really lazy,” she says. “So I found a reason to go back to work.” She now works as a part-time medical file clerk at a drug rehab facility, where she continues to learn. Alfred has close ties to her Manistee, Michigan, community, and she’s concerned about environmental damage to Lake Michigan. But not so much with climate change, which she says “has not been traced back far enough.” She rates herself as “cautious” on the Global Warming’s Six Americas scale. Heidi Steltzer, 45, is an environmental scientist who studies climate change in the Arctic. She looks about two decades younger, bundled up in a scarf and cozy vest in her Durango, Colorado, home office. “I thought I wanted to be an oceanographer, but then I got seasick,” she muses, putting a swift end to any illusion that she’s an invincible, know-it-all scientist. Steltzer is an associate professor of biology at Fort Lewis College. She has an impressive list of academic credentials, but comes across as relatable and disarming. 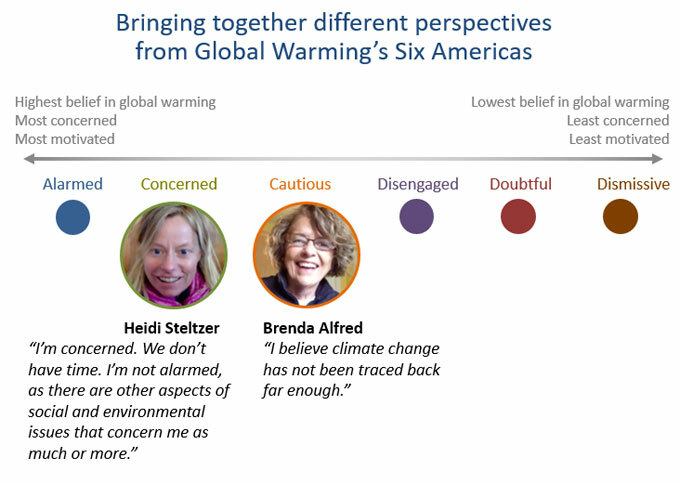 “I’ve been yelled at by other climate change scientists, so I’m excited for the opportunity to see how different a conversation can be,” explains Steltzer, as the two settle in to exchange viewpoints. Before their interview, Alfred and Steltzer rated themselves on the Six Americas spectrum. Image adapted by Karin Kirk from Six Americas study. 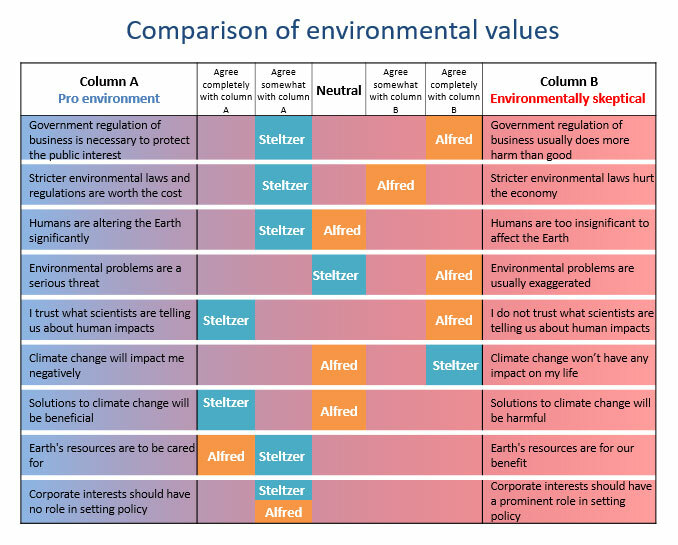 Alfred and Steltzer rated their own values on environmental themes. Responses that fall toward the left side of the table reflect a strong commitment to environmental issues. Responses toward the right side represent a lower priority or lack of trust about environmental issues. Image by Karin Kirk. While Steltzer has devoted her career to understanding environmental issues, her responses to the values questions reflect a diverse set of beliefs. She feels she is safe from the worst effects of climate change, but acknowledges that many people are vulnerable. She says that the media exaggerate environmental problems, even though she knows these problems are real and serious. The biggest gap between Alfred and Steltzer is in their trust of scientists, where each was pegged at opposite ends of the spectrum. Steltzer exemplifies trust-building as she shares experiences from her Arctic research. This past summer, she worked with a Yupik Eskimo student and other researchers to study “drained lakes” in the Alaskan tundra. As permafrost beneath the lakes melts, water slips away into the subsurface, leaving behind a dry lakebed. Far from the traditional scientific discourse, Steltzer infuses her tale with palpable details of the “mushy, squishy tundra,” and the humility she felt working with a Yupik native. While working in the field, Steltzer realized the Yupik student’s observations of the changing landscape were more honed than her own. Steltzer uses an analogy of a dance party to describe the vibrational energy of greenhouse gases as they trap heat in the atmosphere. “The energy the Earth radiates can make carbon dioxide dance,” she explains, throwing in a few disco moves as she speaks. Throughout the conversation, Alfred makes references to the concept of individual responsibility when it comes to taking care of the environment. While that is a sensible starting point, she wonders, are individual actions a sufficient response to large sources of pollution? 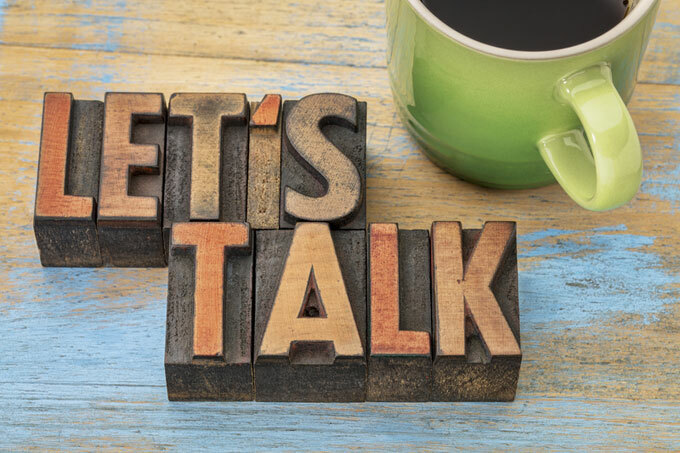 A key consideration in this “common ground” interview approach is that individuals can use perspectives outside their own to more quickly reach new solutions. Instead of drowning-out dissenting voices, can they listen to them, and use them to craft more inclusive policies that could garner broader support?